Hanlon Investment Management has its roots in Tactical portfolio management, which entails identifying and capitalizing on short to intermediate term price trends in a variety of asset classes. As our firm has evolved over the years, we have listened to our clients and developed additional portfolio solutions to meet their diverse needs. These models are our Hanlon Strategic Models (Strategic refers to longer term, buy-and-hold portfolios) and our Hanlon All-Weather Models (which we classify as Dynamic, where we blend Tactical and Strategic). The Hanlon Strategic, All-Weather, and Tactical models are offered on our open-architecture Hanlon Managed Account Platform, alongside dozens of Strategic, Dynamic, and Tactical models from other investment managers. Due to the trend-following investment approach inherent in Tactical investing, one cannot make forecasts and predictions with reasonable accuracy as to what client portfolios will look like in twelve or even six months from now. On the other hand, our All-Weather and Strategic models are constructed on the foundation of long-term asset allocation, which is then fine-tuned based upon our shorter-term (one-year) views, which we are pleased to share in the following commentary. While our 2019 Outlook is most directly applicable for investors allocated to Hanlon All-Weather and Strategic Models, our high-level views and opinions will often contribute to our Tactical asset allocation decisions. Therefore, we encourage all our clients to read on, and we welcome your feedback and thank you for the opportunity to be of service in 2019 and beyond. Broadly speaking, 2018 could be considered one of the worst years for investing of all time. 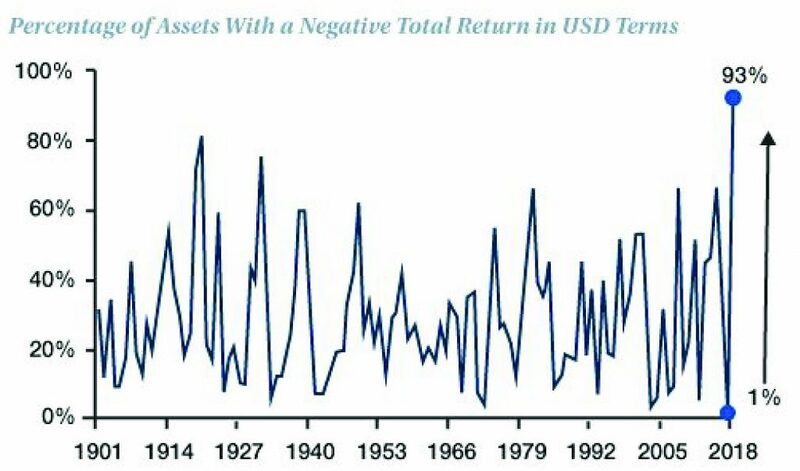 Deutsche Bank noted that a record 93% of assets1 posted negative returns for the year, the most since 1901. Conversely, in 2017 only 1% of assets in the same Deutsche Bank study posted a negative yearly return, the best year on record. Clearly the past two years have been opposite ends of a pendulum swinging between euphoria and fear, and expectations for 2019 should lie somewhere in the middle of these two extremes. 1Major Global Financial Assets defined by Deutsche Bank consist of 60 equity and bond markets (40 developed markets and 20 emerging markets), 4 credit indices, 1 cash proxy, and 5 commodity markets. 2018 was a good reminder how markets, over time, tend to revert to the mean. As we noted in our beginning of the year outlook, 2017 was uncharacteristically calm, with the S&P 500 going without a draw-down of -3% or greater for over a year. This smooth-sailing was bound to be tested, and after tax-cut euphoria caused equity markets to surge in January 2018, the correction was swift, with stocks rising 7% and then falling over -10% in the first 6 weeks of the new year. US Stocks recovered from the pullback and pushed to new highs through the summer months, thanks to record-setting corporate profits and a strong economy. Market capitalizations over $1 trillion dollars for stocks like Apple and Amazon proved to be the crest of the wave, and the initial October correction was likely warranted and healthy. Sentiment quickly shifted, and investors began keying in on potential catalysts that could derail the economy in the coming months. For 2019, fundamentally, there is little to no indication of a recession in the near-term; earnings continue to grow at a steady rate, unemployment is still at record lows with growing wages for workers, and borrowers are not defaulting. However, markets are always forward-looking, and the risks of the trade war strangling global growth and an overzealous Federal Reserve (“Fed”) dominated late-2018 headlines. Despite solid third quarter earnings, many companies lowered guidance for Q4 and beyond due to the uncertainty surrounding the trade dispute. As a result, we saw many companies beat earnings forecasts but still suffer share price declines. Markets were further punished when the Fed stayed the course with a final 2018 interest rate hike amidst market volatility. For the last quarter of the year, the S&P 500 bounced between technical support and resistance levels, as the bears ultimately took control when the S&P failed to hold at 2,600 and closed-out the year with a -4.38% loss on a total-return basis. In Q4 2018, the S&P 500 drew down nearly -20% from its September 20th peak, before bouncing back 6.6% from the Christmas Eve lows. On a price-to-earnings basis, the S&P 500’s P/E ratio (Trailing Twelve Months “Operating” Earnings) has fallen from a high of 21.23 to 17.11 as of year-end. 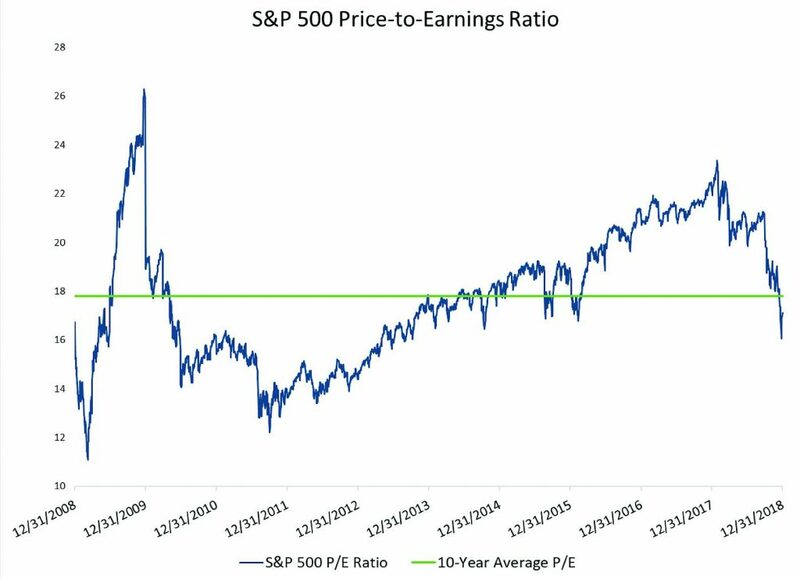 Considering the ten-year average P/E on the S&P 500 is around 17.8, one could argue that US equity prices have in fact reverted to the mean. Whether this means the bottom is in remains to be seen, but since this “resetting” of equity prices coincides with the start of a new year, now is the perfect time to step back and examine Hanlon’s asset allocation views and reassess our positioning. For most of 2018, US economic data was stellar across the board. The seasonally-adjusted unemployment rate of just 3.7% is the lowest level since 1969, and wage growth is at a nine-year high. Higher wages typically spur higher prices, but inflationary data has remained right around the Fed’s target of 2% (measured by the annual change in the core Personal Consumptions Expenditures Index, or PCE, which excludes food and energy). Thus, it would appear that the Fed has succeeded in achieving its dual mandate of full employment and price stability. Many investors, and President Trump, would give the Fed a much lower grade on policy implementation in 2018, however, arguing that without significant inflationary pressure, and with forecasts for lower inflation on the horizon, the Fed should have paused on the December rate hike amidst market volatility. The Fed would of course respond to such arguments by stating that interest rate policy decisions are driven by numerous factors and stock market gyrations are not a major consideration, however, one must wonder if the December rate hike was at least partially a symbolic statement of the Fed’s independence amidst vocal criticism from President Trump. While the December rate hike was a bitter pill for the markets to swallow, it may prove to be the best course for the long run. 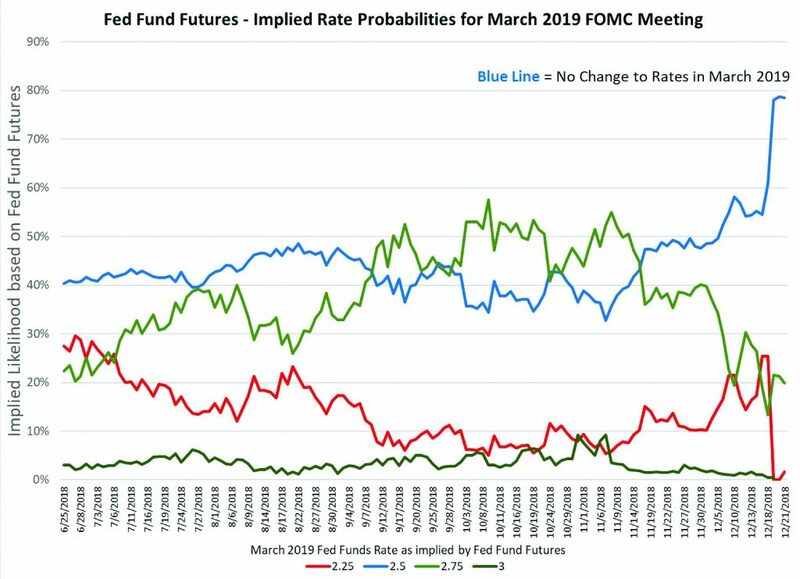 The Fed’s forward-looking commentary suggests that it will be more apt to stand aside in the coming months, and market participants are now overwhelmingly predicting that the Fed will not raise rates again until June at the earliest; some see no rate increase at all in 2019. While these expectations can change, for the time being a major source of worry – Fed interest rate policy – has been lessened. Heading into 2018, most forecasts called for continued synchronized global growth, a prediction that did not come true as the US pulled away from the pack. The US economy’s relative outperformance has attracted foreign investment, pushing the US dollar higher, and thereby compounding the stress on many emerging market countries who rely upon funding in US dollars. Year-over-year (YoY) US GDP is projected to increase from 2.2% in 2017 to 2.9% in 2018, a rate widely regarded as unsustainable for such a large and mature economy. The temporary boost to GDP from corporate tax cuts has begun to fade, and domestic growth in 2019 is forecasted to decelerate to an annual rate of 2.6%. Elsewhere, GDP growth took a step back in 2018, as the Eurozone stalled, and YoY GDP eased to just 1.9% (projected) in 2018 after clocking in at 2.4% the year prior. Eurozone GDP is expected to slide further in 2019 to just 1.6%. Japanese GDP growth also slowed in 2018, from 1.9% in 2017 to a projected year-end rate of just 0.9% in 2018 and is anticipated to remain at that level in 2019. The slowing growth in the European and Japanese economies is concerning, considering their central banks have yet to begin the unwinding of quantitative easing measures that caused their respective balance sheets to balloon larger than the $4.4T peak for the US Fed. Meanwhile China, the growth engine for the global economy, slowed in 2018 from 6.9% to a projected rate of 6.6% with further deceleration to 6.2% forecasted for 2019. As previously stated, lofty equity valuations fell back to earth late in 2018, and stocks may struggle to find direction from current prices until we see resolution to the US-China trade dispute. The US has imposed tariffs on $250 billion worth of Chinese goods, with another $200 billion on the table set for March 1. The potential impact of tariffs was a major theme in Q3 earnings calls, and companies are lowering profit forecasts in anticipation of a prolonged trade dispute. Expect that theme to continue for Q4 earnings calls. The lowered forecasts introduce the possibility of substantial upside earnings surprises in 2019, if progress can be made on a trade agreement or if forecasts reveal themselves as having been overly conservative. Value-boosting corporate stock buybacks have slowed somewhat but shall remain a good bid underneath stock prices as companies continue to repurchase their own stock as a method to return capital to shareholders. Discussion on whether stock buybacks are the most efficient way to return value to shareholders or the most efficient use of surplus funds, in-general, are likely to continue as capital structure decision makers reflect on this strategy. We expect equity market strength may also be fueled by merger and acquisition (M&A) activity as companies seize the opportunity of relatively low interest rates to perhaps offset future margin compression while signaling to broad-market investors that value exists in this market. Chart by Hanlon Research, Source: CFRA, Bloomberg. 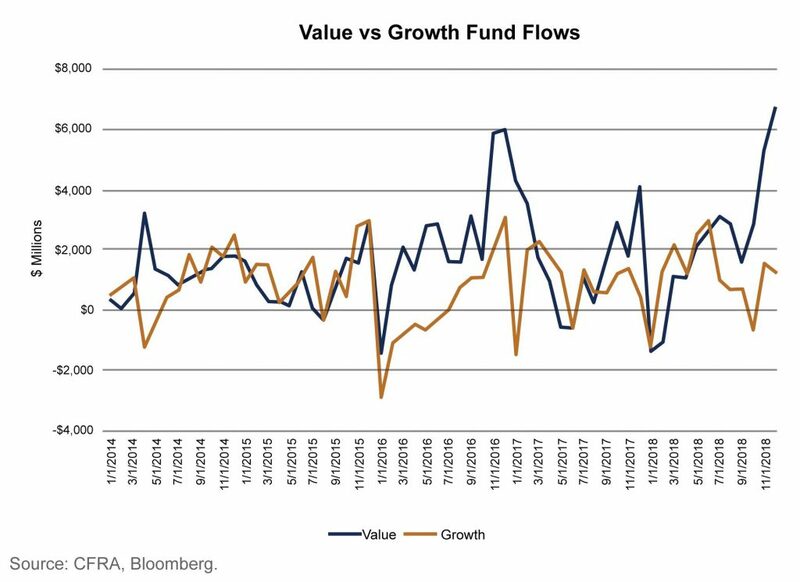 For some investors, the fourth quarter volatility was a signal that it was time to rotate out of growth and into value stocks. The rationale for this move is that we are in the late stages of the business cycle, and investors should de-risk their portfolios accordingly. While we are likely in the late stages of the current cycle, we also do not forecast a recession in the next 12 months. It is not uncommon for equities to rally sharply during the final stages of a bull market, therefore it may be premature for investors to abandon growth equities altogether. Positive surprises such as a breakthrough on trade talks, earnings beats, a rise in M&A, massive share repurchases, or better-than-expected economic data would give growth stocks an extra boost. Heading into 2018, the Eurozone economy was firing on all cylinders, keeping pace with the US. A year later, the picture looks much different, with European economic data disappointing for much of 2018 and geopolitical risks still very much in play. The details of the UK Brexit from the European Union remain unresolved and add to uncertainty surrounding business planning and investment there. The German economy, which had been the stabilizing force throughout the economic recovery and during the Greek debt crisis, has sputtered. Eurozone manufacturing Purchasing Managers Index (PMI) readings show manufacturing activity barely above the point of contraction at 51.4, down from a peak of 60.6 in late 2017. Italian debt, at nearly 132% of GDP, threatens to throw the country into political turmoil and will surely test the mettle of the European Union as slowdown-fueled resentment grows between the haves and the have-nots. With so many risks on the table, investors may wonder if they should allocate any capital to the Eurozone, or any Developed International Equity market for that matter. For investors seeking broad global equity exposure, Developed International equities should remain a foundational portfolio component, since they comprise roughly 36% of the global equity market capitalization. Many US investors are already significantly underweight compared to the global market cap, and while the US has outperformed in recent years, this relative outperformance may be coming to an end. Investors should consider that while the US is nearing the end of the expansion phase of the business cycle, Japanese and European markets are a bit earlier on in the business cycle. The US Fed has been aggressively raising rates and letting its balance sheet unwind, while foreign Central Banks have taken a more cautious approach. While the risks noted above are still significant, they have been known variables for some time now and are largely priced into equity valuations, therefore any positive outcome would trigger relative outperformance. Emerging markets were battered in 2018 due to a combination of rising US Treasury yields, a stronger US dollar, the US-China trade conflict, and geopolitical turmoil in Argentina and Turkey. In the third quarter, we argued that emerging market equity valuations were beginning to look very attractive for long-term investors who can stomach the volatility. As the trade war has dragged on, valuations have slid further, and the P/E ratio on the MSCI Emerging Markets Index ended the year around 11.5. Concerns over rising US interest rates have faded somewhat, with the Ten-Year Treasury yield now well below 3% after encountering strong resistance near 3.25%. Dollar strength and the trade dispute may weigh on EM equity for a bit longer, but we think both headwinds will fade. One would expect the US and China will act in their mutual best interests and reach a resolution that allows both sides to claim a margin of victory, as President Trump turns his attention towards his 2020 reelection. The Chinese government has shown a willingness to step in with stimulatory measures in the past and has vocally expressed their readiness to do so again. After enduring a nearly -25% decline in the Shanghai Composite for calendar year 2018, the biggest drop since 2008, expect President Xi Jinping to utilize economic stimulus measures to combat further declines. Emerging markets are certainly subject to risks – currency and geopolitical concerns are always on the table, hence the generally lower valuations – but we believe EM equity is currently cheaply priced, making this an excellent point for long-term investors to initiate or increase exposure. Treasury yields moved steadily higher in 2018, as the Fed kept its promise reigning in stimulus measures. The Ten-Year Treasury Note yield made an aggressive push above 3% in October, encountering resistance at 3.25% and fading with a flight to safety to end the year at 2.68%. 2019 could possibly mark the peak for the current business cycle, as the Fed has signaled that rate hikes could slow down this year, and the markets are clearly pricing in a dovish Fed. This does, however, open the possibility of a more hawkish surprise to the market if economic data, particularly inflation, were to accelerate to the upside. As interest rates rose in 2018, investors who had been chasing yield began shifting out of more risky asset classes and into the relative safety of investment grade and government debt. Many risk-averse investors had migrated down in credit quality to high yield bonds, enticed by the higher yield. With higher quality bonds now offering more sufficient yield, there has been some selling pressure on junk-rated bonds as investors reassess their positioning and risk tolerance. High yield bond spreads have widened significantly during the 2018 year-end selloff, perhaps due to panic selling as high yield defaults remain very low and are not projected to increase dramatically. This is an attractive entry point to purchase US high yield bonds, where appropriate. Fixed income investors should also look at the geographic breakdown of their portfolio holdings, and consider emerging market bonds, particularly local currency bonds. Emerging market bonds performed poorly in 2018 but have begun to show relative strength as US dollar strength has waned slightly to close out the year. The VanEck JPMorgan EM Local Currency Bond ETF (EMLC) currently yields nearly 6.5%, making EM debt an attractive source of income for bond investors. Crude oil prices are limping into 2019 after being decimated in late 2018, falling over -40% from their October 3rd high of $76.41 for US West Texas Intermediate (WTI). Concerns over slowing global productivity combined with record US shale oil production and a less-than-anticipated impact from Iranian sanctions to drive prices down to the low $40s. Further downside risk still exists even though OPEC will likely aggressively cut output to put in a floor around the current trading range. If prices were to break below $40 and remain there for any prolonged time, US shale drillers would likely begin to shelve unprofitable projects. Breakeven prices for shale drilling can vary dramatically by location, but $45 is a good estimate for the price required to keep production levels steady. Rather than invest directly in crude oil, we advocate for exposure via Master Limited Partnerships, known as MLPs. MLPs own the pipelines and storage facilities, and typically are less volatile than oil during times of extreme price swings. They also come with the added benefit of mid-to-high single digit yields, providing consistent income. With the US still producing high volumes of oil and gas, MLPs can provide attractive yields and offer diversification benefits. Another alternative source of yield and diversification that we typically utilize in our portfolio construction processes are Real Estate Investment Trusts, or REITs. REITs, like most high-yielding asset classes, struggled with a rising-rate environment in 2018. REITs are a diverse group, with sub-sectors investing in residential, commercial, health-care, telecommunications-related and various other real estate holdings. Therefore, performance can vary among individual REITs. Retail REITs, for instance, have struggled as brick-and-mortar mall traffic has declined, a trend that will likely continue in 2019. Other sub-sectors may offer more attractive opportunities, such as healthcare REITs, which stand to benefit from an aging US population, technology REITs that manage datacenters, or telecommunications REITs involved in the transition to 5G cellular coverage. Investors should also look beyond the US REIT landscape, and consider international REITs, which trade at much lower price-to-earnings multiples than their domestic counterparts. Owning international REITs provides comparable yield but additional diversification benefits and less interest rate risk, as most foreign central banks are pausing on or have not yet begun to implement interest rate hikes. Both domestically and abroad, there has been a notable increase in mergers and acquisitions within the REIT space as private equity firms and sovereign wealth funds capitalize on attractive valuations, and we anticipate the trend to continue in 2019 as REITs remain cheap relative to their underlying values. REITs too come with the added benefit of mid-to-high single digit yields, providing consistent income. Wild market fluctuations like we have seen over the past year can be scary and trigger irrational emotional reactions. During times like these, it is important to remember that the stock market and the economy are two distinct entities. Stock market volatility can be exacerbated by investor psychology or triggered by technical trading patterns. Therefore, we often see pullbacks and corrections despite no imminent threat of an economic recession. The resulting corrections can be difficult to endure, but if the underlying economic and business data remains structurally intact, the volatility will resolve itself, allowing markets to find equilibrium and revert to the mean. Past performance is not a guarantee of future results. This Education Series is limited to the dissemination of general information pertaining to its investment advisory services and is not suitable for everyone. The information contained herein should not be construed as personalized investment advice. There is no guarantee that the views and opinions expressed in this newsletter will come to pass. Investing in the stock and bond markets involves gains and losses and may not be suitable for all investors. Information presented herein is subject to change without notice. Hanlon has experienced periods of under-performance in the past and may also in the future. 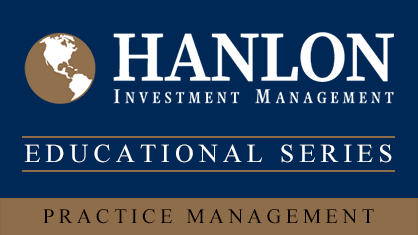 Hanlon Investment Management (“Hanlon”) is an SEC registered investment adviser with its principal place of business in the State of New Jersey. Hanlon and its representatives are in compliance with t he current registration and notice filing requirement imposed upon registered investment advisers by those states in which Hanlon maintains clients. Hanlon may o nly transact business in those states in which it is notice filed, or qualifies for an exemption or exclusion from notice filing requirements. Any subsequent, direct communication by Hanlon with a prospective client shall be conducted by a representative that is either registered or qualifies for an exemption or exclusion from registration in the state where the prospective client resides. For information pertaining to the registration status of Hanlon, please contact Hanlon or refer to the Investment Adviser Public Disclosure web site (www.adviserinfo.sec.gov). For additional information about Hanlon, including fees and services, send for our disclosure statement as set forth on Form ADV from Hanlon using the contact information herein. Please read the disclosure statement carefully before you invest or send money. Not all Hanlon clients are in the strategies discussed herein.